The Abbott Block was named after City Clerk Alexander S. Abbott, who served the city from 1858 to 1890 and lived at 227 Queen’s Avenue, not far from the streetscape depicted in Templar’s painting. Like Albert Templar’s Ridout and Carling Streets (1954, also in the Museum London Collection), this painting of the Abbott Block depicts a London street scene on the verge of transformation. In 1928, on the northeast corner of Dundas and Wellington Streets, a new City Hall would be built from the existing structure of the Public Utilities Commission building. 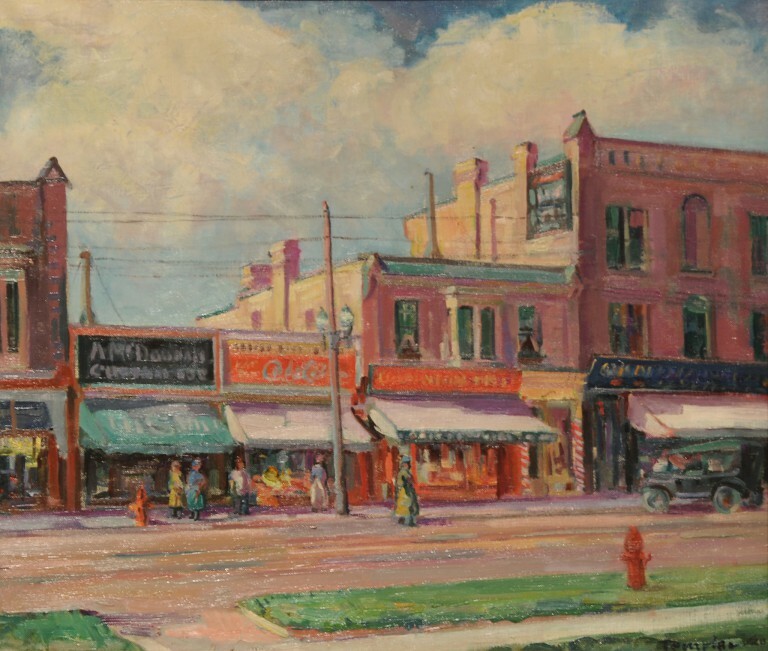 The DundasCity Hall remained in use until 1971, when a new City Hall opened at 300 Dufferin Ave. What seems in Templar’s painting to be a quiet urban neighbourhood would become the seat of London’s civic government. A fascinating counterpart to this painting can be found in the London Room Photograph Archives at the London Public Library. Dated circa 1928, a photograph depicts Dundas and Wellington Streets in winter, with pedestrians negotiating sidewalks recently covered with a layer of snow and slush. In Templar’s painting, only one car is visible; pedestrians, shopkeepers and a verdant stretch of grass take precedence. The photograph, in contrast, depicts London as a busy metropolis, with an unbreakable line of cars and dynamic sightlines conveying the notion of unstoppable urban growth.